In the heart of Surry Hills you will come across a little terrace with red walls. The aromas of Vietnamese cooking will pull you in to this cosy, yet buzzing and upmarket atmosphere. Luke Nguyen, his sister Pauline and Pauline’s partner, Mark Jensen, own this fabulous little restaurant – Red Lantern. The décor is authentic yet modern with it’s polished wooden floorboards and yes – you guessed it – red lanterns hanging from the ceiling. After 3 months of waiting for the first available Friday night my friends and I were very excited. Red Lantern was awarded the winner for the 2010 I love FOOD awards Favourite Vietnamese Restaurant in Australia. They were also in the top ten ‘Most Environmentally Sustainable Restaurants’ in the Sydney Morning Herald Good Food Guide 2010. It’s no wonder this place has such a long waiting list! With a group of 7 people we were required to choose from one of the two tasting menus. We chose the $75 per person option, as this included dessert! The staff and chefs were very friendly, knowledgeable and accommodating regarding gluten free options. I was assured that the banquet could be modified to suit my dietary requirements. The menu itemises what dishes are gluten free so I had complete trust that they knew what they were talking about. 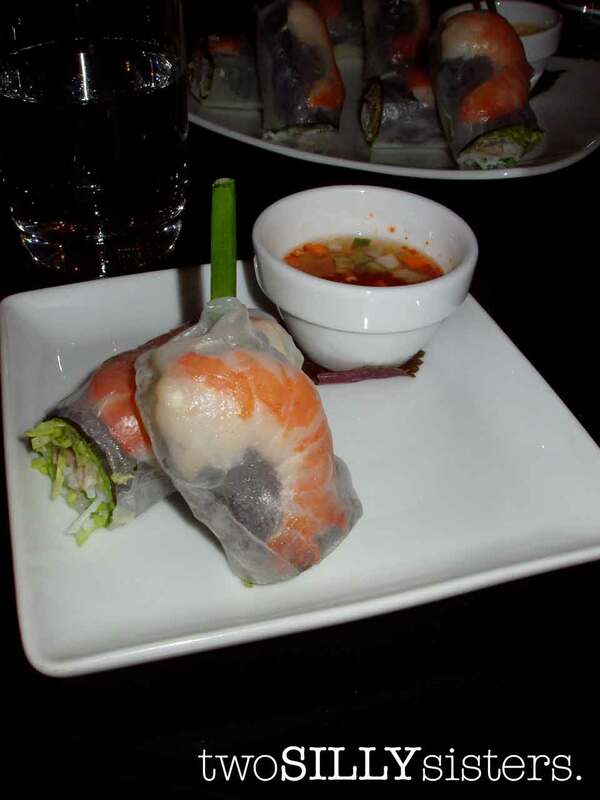 We started off with Goi Cuon – soft rice paper rolled with prawns, pork, vermicelli, perilla leaves and garlic chives. I was brought out my own plate with a special gluten free dipping sauce. Entrée two was a dream and one of Red Lantern’s signature dishes. Muc Rang Muoi – lightly battered chilli salted squid with fresh lemon and white pepper dipping sauce. Pre coeliac salt and pepper squid was one of my favourite dishes to eat when out. However in the past two years it has been hard to find gluten free varieties. As the next dish was not gluten free I was ready to sit out a course. However I soon learnt that I was going home with a full stomach just like everybody else at my table. My own dish was brought out as a gluten free alternative. 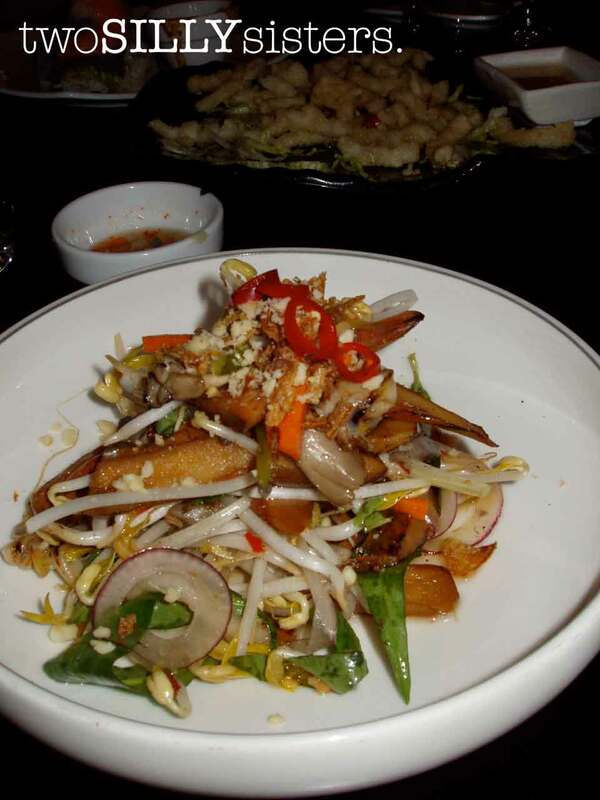 Goi Ngo Sen Voi Nam – Asian mushrooms, pickled lotus root and Vietnamese herbs. I felt very special that the chefs were so accommodating. I was even more impressed when Luke Nguyen himself – host of the SBS series Luke Nguyen’s Vietnam – brought the dish to the table. Each dish was described to me and he made sure to inform me of what dishes I could and could not eat for the rest of the night. Luke was very down to earth and it was great to see him on the floor mingling with the guests. Next we were served two salads. Goi Du Du – tiger prawns, dried whitebait and green papaya, with perilla and mint. The second was again my own dish as a gluten free alternative. This was a dish of eggplant, tofu, bean sprouts and juicy, sweet tomatoes. Throughout the night the service was immaculate. Glasses of water (and wine) were kept full and tables were wiped down between courses. There was even an incident of too much chilli being consumed by one of my friends, Krystal. Luke was very kind to bring out a rescue remedy of tomatoes. Apparently the acidity of the tomatoes counteracts with the spiciness of the chilli – and it worked! Just when we thought it had to be near the end of the meal – mains started coming out! We had a selection of Ca Xao Sot Cai Xanh – panfried Morwong fillets with Asian celery, tomato and chilli, Bo Luc Lac – cubed pasture fed Black Angus sirloin wok tossed with garlic, sesame and black pepper, Cai Xanh Xao – mixed organic Asian greens wok tossed in preserved bean curd sauce, and as my own special dish, Ga Nuong - char grilled Burrawong pasture fed chicken skewers marinated in preserved bean curd paste, lime and garlic. I was impressed that something as simple as Asian greens could be so tasty! The beef was tender and delicious, and the chicken skewers were another stand out dish for me. When our stomachs were so full and couldn’t possibly fit even another grain of rice, the waitress said some magical words, “I hope you have space for dessert?” I don’t know how but I instantly did not feel so full anymore. I go by the theory that we have a separate stomach for dessert. Out comes the Red Lantern dessert platter – a trio of three desserts. I was instantly disappointed. Having sussed out the menu previously I had my eyes on the Kem Flan – coconut Crème Caramel made with biodynamic eggs and organic coconut milk. This was nowhere in sight. I was informed that only one of the desserts on the platter was gluten free. And it was also a banana dish. To put it nicely I’m not the biggest fan of banana – I hate it. 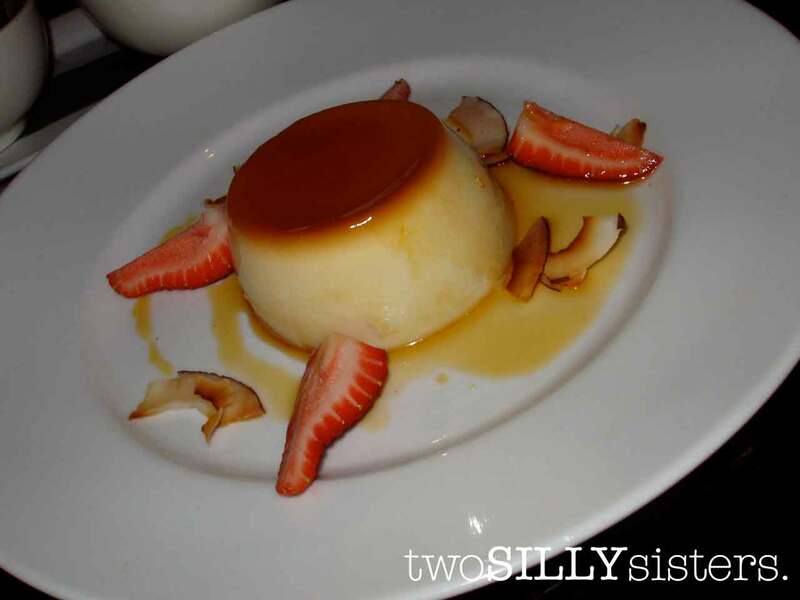 So the chef was nice enough to bring me out my own plate of coconut crème caramel. And can I just say I was in heaven! It was smooth, full of coconut flavour and not sickly sweet. I was kind enough to share the plate around the table but I could of easily finished it myself. It was divine. 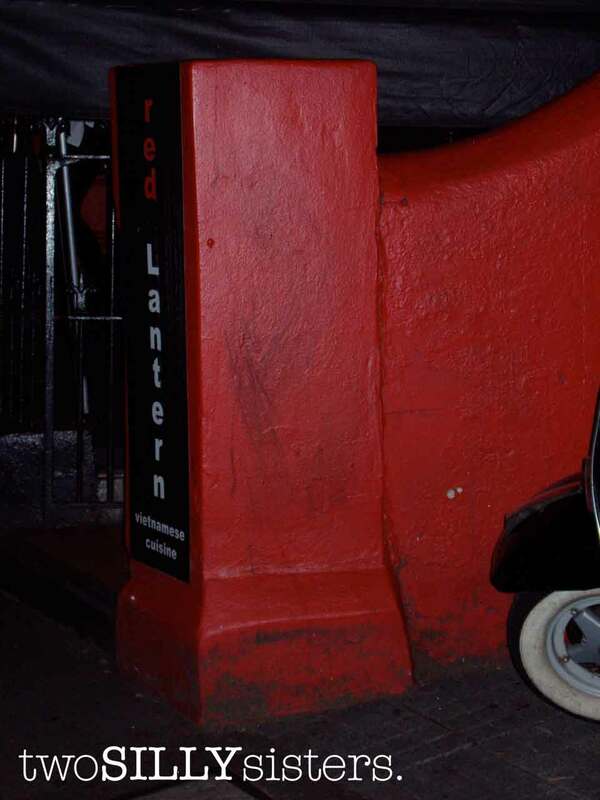 Red Lantern I will definitely be back. The flavours were amazing, the presentation of food brilliant, the staff were very friendly and most importantly gluten free options were not an issue. 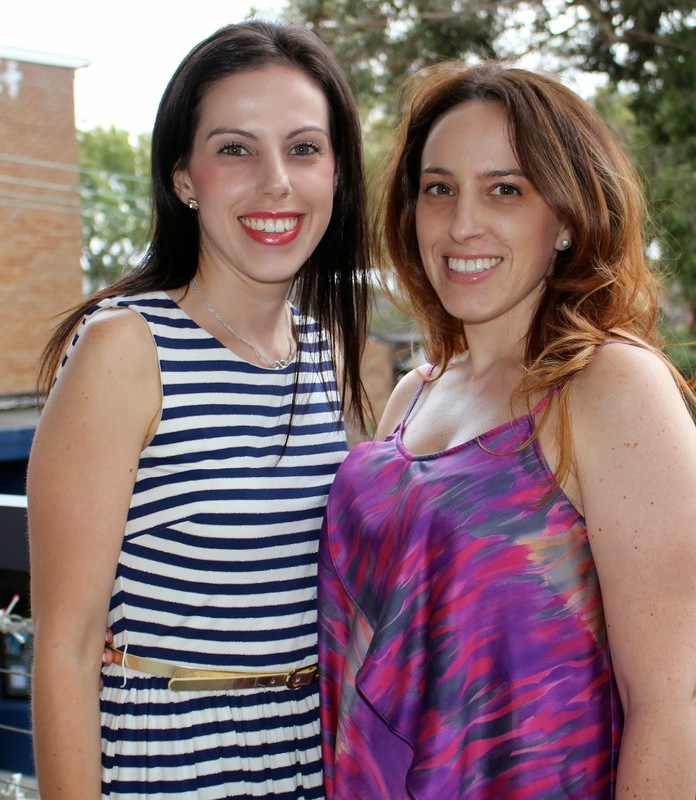 I was treated like royalty and by the end of it my friends wished that they too were coeliac! Thank you for an amazing and tasty night out. Anonymous said... Thanks TSS - great review! I am drooling in anticipation. 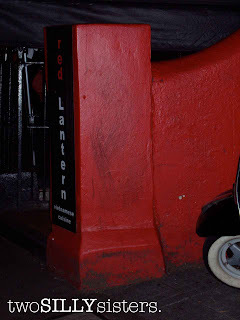 Cant wait to get back to Sydney in November and dine at Red Latern. Guess I better make a reservation now! Thanks JK. We hope you enjoy it just as much as we did (no doubt you will!) And yes good idea to book now ;o) Would love to see some pics! Red Lantern is my favourite restaurant since I moved to Sydney two years ago and I'm almost a regular. Have a closer look on the décor, not only red lanterns are hanging from the ceiling. There is an antique radio receiver and its brand is "Red Lantern". The food is delicious and the service flawless. I didn't notice the radio receiver. Will have to go back just to check it out. Like I really need an excuse... The thought of the food makes my mouth water!